"By opening with the scornful critique of one who would go on to become another literary great, Grass sets the stakes high for his own efforts: he is out to prove Henry James wrong. With this book, the results of rigorous and probing research recounted in energetic prose and with captivating storytelling, Grass fully succeeds… By illuminating the context around the writing, publishing, and reception of this novel, Grass succeeds in providing a rich resource towards the growing scholarship on Dickens’s final work, and more than drowns out the harsh words of a young American critic that have too often dwarfed the book itself." Contents: Introduction: Our Mutual Friend: ’the poorest of Mr Dickens’s works’; The man from somewhere: Ellen Ternan, Staplehurst, and the remaking of Charles Dickens; The cup and the lip: writing Our Mutual Friend; Putting a price upon a man’s mind: Our Mutual Friend in the marketplace; A dismal swamp? 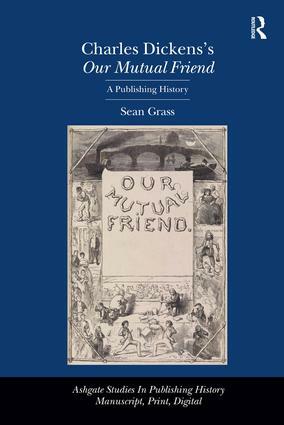 Our Mutual Friend and Victorian critics; The voice of society: Our Mutual Friend since 1870; Appendices; Bibliography; Index. Sean Grass is the author of The Self in the Cell: Narrating the Victorian Prisoner (2003) and essays on Dickens, Wilkie Collins, and Christina Rossetti, among others. He is an Associate Professor of English at Iowa State University, USA.